Congratulations to the Design Team for winning the 2015 National ASHRAE Technology Award First Place for Residential Buildings for Stack House a multifamily project with Vulcan & Runberg Architects. An innovative Reverse Cycle Chiller heat pump system in the parking garage provides domestic hot water for the largest of the residential buildings. 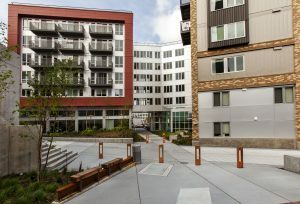 The building is currently operating at an EUI of 19.6 kbtu/sf/yr; making this the most efficient large multi-family building in WA state using half the energy of a typical building. Ecotope provided mechanical and plumbing engineering services and energy efficiency modeling and consulting services. See the full project write up and photos here.